MattyCollector.com has posted the info for April’s sale items. DC Comics and Masters of the Universe fans have plenty to look forward to. – 12″ Lex Luthor: The final figure in the 3-figure series is fully articulated and sculpted in film-accurate detail. If you haven’t seen one of these 12″ figures yet, they are absolutely impressive. – 12″ Superman: Here’s another chance to get the definitive Superman in fan-demanded 12″ scale. This is #2 in the series. – 12″ General Zod: All kneel before… well, you know who to kneel before! The General is #1 in the series (of course). – Retro-Action® DC Super Heroes™ Sinestro: Thaal has landed at MattyCollector.com! The first figure in our exclusive 4-figure series features a cloth uniform and a power battery. – Disney – Pixar Cars Barry Diesel: A Matty exclusive, this 1:55 scale die-cast version is based on the oil guzzler from the original Cars film. 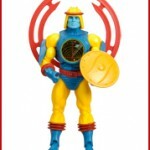 – MOTUC Sy-Klone™ Figure: The Club Eternia® Figure of the Month for April blows into town with his TECH vest, cosmic shield, and battle ring that attaches to his backpack. Included with 2011 Club Eternia® subscriptions. 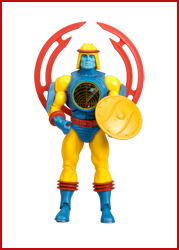 – MOTUC Panthor® Figure: Lucky for Panthor®, we believe in equal protection under Eternian law, whether you’re good or evil – hence the hefty helmet on our April Club Eternia® Subscription Figure! Included with 2011 Club Eternia® subscriptions. – MOTUC Weapons Rack: This is an authentic re-creation of the vintage Castle Grayskull® weapons rack! Comes with multiple Eternian weapons in both silver and Man-E-Weapons red. Not included with 2011 Club Eternia® subscriptions. – MOTUC Moss Man® (re-issue*, unflocked ears): Sometimes it actually is easy being green, especially when you carry a big ol’ club! Most packages will have a graphic burst stating “The Original.” Not included with 2011 Club Eternia® subscriptions. Please note, we’re still working on images for some of these products, which is why you can’t link out to the product pages right now. As soon as they’re available, we’ll update the links. Remember, if you’re a Club Eternia® subscription holder, Sy-Klone™ and Panthor® ship to you automatically. All other items are available Tuesday, March 15th at 9 a.m. Pacific (12 noon Eastern). * A small percentage of customers will receive product from the first run and the package will not contain the burst. This is random and we can’t control which package will be received.